Sometimes I complain in my reviews about a lack of documentation in the booklet. There is nothing to complain about here - quite the contrary. The booklet includes lengthy essays by Gilbert Blin, in English, German and French. That may seem a little exaggerated — and the notes could have been more concise — but makes much sense. In the time of absolutism French society was completely dominated by the monarchy, and that included cultural life, especially under Louis XIV. Many compositions can hardly be fully understood without some knowledge of French politics and society in his time. 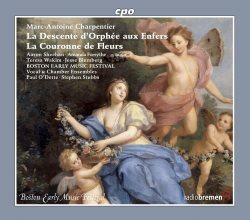 La Descente d'Orphée aux Enfers is one of Charpentier's better-known works for the theatre, but La Couronne des Fleurs is a much rarer bird. It was originally written on a text by the famous playwright Molière with whom Charpentier worked closely in his early years. As Eglogue en Musique et en Danse it was meant as the prologue to Molière's play Le Malade imaginaire for performances in 1672. That was also the last time it was performed as in 1673, after the death of Molière, Jean-Baptiste Lully used his royal privilege to forbid any performance of Le Malade imaginaire. The revised version of the prologue, under the title of La Couronne des Fleurs, probably dates from 1684. The central figure is Flore, the goddess of flowers and greenery, who has always been closely associated with spring. In this Pastorale she invites shepherds and shepherdesses to a contest. He or she who most eloquently sings about the deeds of Louis XIV will receive a crown of flowers. After several attempts the god Pan intervenes, stating that no poem is good enough to sing Louis' praise. The contest is cut short, and instead of the crown of flowers for the winner every participant receives one flower. There are two historical connotations. The first is that there was a direct reason for this praise of Louis XIV: the Truce of Ratisbonne in October 1684 which ended the war he had fought against the Holy Roman emperor Leopold I and the king of Spain, Charles II. Festivities were held in the spring and summer of 1685, after a very cold winter. This piece could be meant for a performance as part of these festivities, but whether it was actually performed is not documented. It has been preserved in manuscript, and the score indicates a performance at the household of Mademoiselle De Guise, Charpentier's employer at the time. At the same time he worked at a revival of Le Malade imaginaire and a performance of La Couronne des Fleurs may be a kind of rehearsal or a try-out. The second connotation is the concept of a poetic contest. This was a popular phenomenon in France at the time. It dated from the Middle Ages and was given a boost in the 17th century through the creation of many royal academies across the country. In the 1680s many contests took place in various places, and one of the most famous was Les Jeux Floraux in Toulouse. Blin suggests that there may be a connection between that contest and Charpentier's Pastorale. La Descente d'Orphée aux Enfers dates from 1686 or 1687 and was probably also performed at the residence of Mademoiselle De Guise. However, there are many indications in the score which suggest that Charpentier had a fully staged performance in mind. At this time Lully's position was increasingly undermined, and in 1687 he died. This could have given Charpentier some hope that he would get the chance to perform music for the stage in the Opéra. This piece, as Pastorale en musique, has been preserved incomplete. Music for the stage was usually written in one, three or five acts, and often preceded by a prologue. This Pastorale is only in two acts and has no prologue. It ends with Orpheus returning to the world of the living followed by Euridice. The moment when looks at her and loses her forever is not included. That would have been part of the seemingly intended third act. Gilbert Blin explains that the fable of Orpheus in Charpentier's time was above all "an example of conjugal friendship and an allegory of the union of the soul and the body". This meaning is lost if the last episode is missing. This is a further indication that this work has to be considered incomplete. It is notable that not only Charpentier's work has survived in only two acts, but also the libretto which is by an unknown author. Apparently, large-scale performances of these two works were planned, but probably never materialised. That seems to be the reason why this recording is based on performances as they might have taken place in the residence of Mademoiselle De Guise. The line-up of the instrumental ensemble is small, with just two violins, three viole da gamba, woodwind and basso continuo. The choruses are sung by the soloists, with two additional voices in the upper part. This results in a strong element of intimacy. I would imagine that the Orpheus story came off with a greater degree of drama in the staged performances at the Boston Early Music Festival of 2011. It is not easy to tell the sopranos apart as there is a strong similarity between them. However, the scores suggest that singers often took several roles under Charpentier's direction and that makes a connection between a specific voice and a character less urgent. In general what we hear on this disc is pretty much ideal. All the singers have the right voices for the repertoire and give stylish accounts. In French music for the stage the text was very important, and therefore the excellent delivery of all the singers is especially praiseworthy. Aaron Sheehan could have reduced his vibrato in the early stages of La Descente d'Orphée aux Enfers, but otherwise his interpretation of the role of Orpheus deserves special praise. With this production Paul O'Dette, Stephen Stubbs and CPO continue their successful cooperation. This has previously resulted in such excellent recordings as Lully's operas Thésée and Psyché and Charpentier's Actéon. Lovers of the French baroque are lucky as they can add another fine disc to their collection.